An atlas published by the Chinese government in 1969 identifies the Senkaku Islands by their Japanese name, new evidence that the group of islands in Okinawa Prefecture is inherently Japanese territory, the Foreign Ministry said Monday. 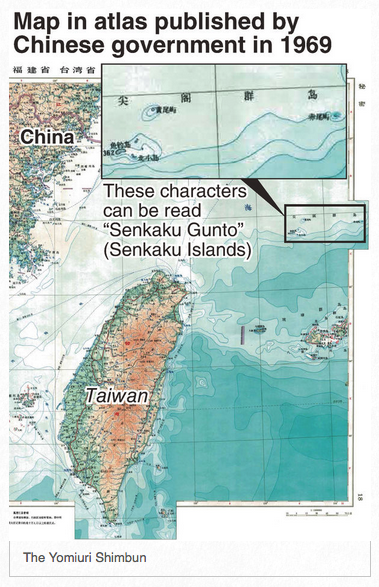 The ministry has posted the maps in a section featuring the Senkaku Islands on its website. The map is part of an atlas published in 1969 by the then Chinese State Bureau of Surveying and Mapping, the equivalent of the Geospatial Information Authority of Japan. In addition to referring to the overall group of islands as the “Senkaku Islands” in Japanese characters, the name of Uotsuri Island, the westernmost island in the group, is also written in Japanese characters. Yoshiaki Harada, a Liberal Democratic Party member of the House of Representatives, obtained the atlas from a former Foreign Ministry bureaucrat and showed it as evidence during his interpellation at the lower house Budget Committee meeting on Feb. 23. The Chinese government began claiming the Senkaku Islands in 1971 after the then U.N. Economic Commission for Asia and the Far East — presently the U.N. Economic and Social Commission for Asia and the Pacific — released a report in May 1969 that said oil reserves may exist in the islands’ seabed.